Some people hated the Angel of the North at its inception. Ten years on, have they changed their mind? Eyesore. Bad art. Waste of money. When the Angel was first planned in the mid-1990s and up to its construction in 1998, there was considerable opposition from many local people, politicians and even art critics. Since then many people have come to love it. Here four of the most vigorous critics reveal whether their views have softened with time. I'm afraid my views are exactly as they were. It is a monstrous ugly object and God knows why it got planning permission. When you've got something as big as that and it isn't going away you might as well exploit it. It's an identification object. But if you are talking about it as art, it's nought out of 10. It's about as engaging as the gigantic arms of Saddam Hussein on the way into Baghdad. They have exactly the same fascist [undertones]. 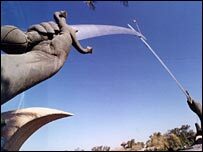 I can't understand how people don't realise it is like a statue from almost every undemocratic regime. It has been quite subversive in its way. It has allowed all sorts of monstrous things to go up in public places. It has led to the conviction that if it's big enough we will cower in awe. 1998 view: "It's awful, I'll never like it"
2008 view: "I love it"
My views then were purely cosmetic. I don't like modern architecture. I don't like modern art. But I'd like to put my hands up and say I love it now. It is a brilliant landmark for our hotel. We have had a lot of film crews. We have had Gary Lineker making an advert. At the time there were a lot of mixed feelings. I can come to work and see the Angel but then I can go home. There are people who open their curtains and it's like living with it at the bottom of the garden. But more and more people are warming to it. When I'm coming down the road and I turn that bend it's just brilliant. It would be a miss if it wasn't there. We are very proud of it. My only wish is that it was floodlit at night. It would look magnificent. 1998 view: "I can see this vast eyesore from my home"
2008 view: "Better things to spend public money on"
I still think it was an unjustifiable large amount of public money but people have got used to it. People are resigned to it being there. I still don't think it is a very attractive piece of public art. The Angel of the South planned for Ebbsfleet is funded by private money which I've no problem with. I'm not sure the Angel of the North is that popular locally, no-one's mentioned it to me. There is a lot of nonsense talked about it. Gateshead produced ridiculous figures saying it attracts lots of visitors to the area. 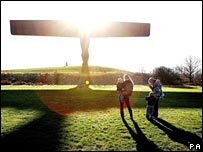 I don't believe anybody visits the North East specifically to look at the Angel of the North. There are better things to spend public money on. If these things are popular they should be done as they were in Victorian times by generous corporations and publicly spirited individuals. I keep being told that the Angel of the North has brought all this money but I don't see it on the ground. Where is this wonderful pot of gold at the end of this wonderful rainbow? I'm sick to death of the hype, sick to death of all this spin. We are in one of the outlying areas of Gateshead and we get nothing from the Angel. There are accidents on the bypass. It is a distraction and this is what causes some of the accidents and congestion. Residents are not overenthusiastic about the Angel. Over 5,000 people said they were against it in 1998. The situation hasn't got better for local residents. I went out and surveyed people recently and asked them three things that the Angel had done for us. They said to me: 'Nowt'.